I'd noticed the store years ago. I always notice these kinds of stores. The neat, trim window front. The simple but blinding display. I remember gazing through that window longingly, craning my neck to look at price tags, before my husband and I got engaged. The small leather boxes twinkle with memories, shiny and solid. The thick black velvet cradles a necklace of golden stones, a bracelet of blue and red and even a tiara. Green stones blinking, seed pearls tiny and imperfect, set out for the world to see. I can count on one hand the pieces of nice jewelry that I own. Well, actually, half a hand. I'm not that into jewelry really. In fact, I never so much as look at it . . . unless, well, unless it's old. There is something about estate jewelry. In this world of sameness, estate jewelry is one of a kind. Truly unique. Most often it is hand crafted. It holds a story. Memories. History. Who knows who owned it before? Whose great grandmother? Some marchioness in a distant land? Like all good second hand goods, it also comes cheaper than new and doesn't serve up a big ole carat of guilt. Few things come with as much eco-baggage as new jewelry. I had long heard of the trouble with diamonds. I watch Blood Diamond. The entire continent of Africa has been torn asunder, children have been turned into soldiers, women raped, villages destroyed as various factions fight over diamonds. I had no idea, however, that the eco-issues with jewelry don't stop at diamonds. According to Big Green Purse, gold mining is equally problematic. "Toxic chemicals like cyanide and mercury, which leach gold out of rock, pollute drinking water supplies, contaminate farmland, and threaten the health of workers and communities. One gold ring generates 20 tons of mine waste." Read more about the impact of gold mining at No Dirty Gold. Which brings me back to the window in front of me. Patina. That's the name of the store. It connotes a beauty that comes only with natural aging. I twist the engagement ring on my finger. A vintage piece that my husband bought at an antique store. I love my ring. I've never seen another like it. It holds my history as well as the history of some other woman from some other time. The impact of its creation are long past. The small diamond still gleams in the sunlight. Yes, I love this ring. 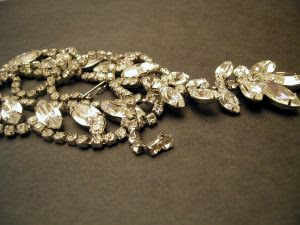 But, if I were to ever need another piece of jewelry, a pretty necklace, for instance, I'd know where to look. After all, diamonds - certain diamonds - are a girl's best friend. My husband searched vintage when it came time to pop the question, although he ended up going the custom route. I have a ring totally unique to me. Not another one like it in the world. I love it. The fact that it was crafted from materials pre-loved, even better. we recycled rings from our previous relationship (some may find this a tad off i know), old gold teeth from long gone relatives and parents engagement rings to construct our eco-wedders! I can never understand why youd pay for the huge markup of a 'new' diamond when theyre all old anyway! Buy second hand and remodel! Too easy. Some of my favorite pieces of jewelry were my Grandmothers. The necklace and earrings I wore on my wedding day were hers, very fitting because they were gifts from my Grandfather. They are beautiful, unique, and I love the family connection. It was like she and my Grandfather were there sharing my big day with me. That one line - one gold ring generates 20 tons of mine waste - literally startled me in my chair. I had no idea. Sheeep: Nice! Never thought of crafting a ring from pre-loved materials beyond estate jewelry. Kel: I'm so with you!! Why spend all that money! Your ring sounds so wonderfully full of history. Condo Blues: That sounds fantastic! My wedding ring was also my grandmother's, and then my mother's. It infuses so much more meaning into a piece of jewelry. Katrina: Me too!! I had no clue until I read that. Donna: That's funny. My dad was a dentist and, when I was a kid, had his lab in our house. He'd let us sift through the ashes from time to time to collect the gold. I felt like I was panning for treasure! I'll drink to that with... a cup full of summer! Tax Credits for Conscientious Waste Disposal? What has four legs, fur, and is green?